Corruption is once again high on the international policy agenda as a result of globalization, the spread of democracy, and major scandals and reform initiatives. But the concept itself has been a focus for social scientists for many years, and new findings and data take on richer meanings when viewed in the context of long-term developments and enduring conceptual debates. This compendium, a much-enriched version of a work that has been a standard reference in the field since 1970, offers concepts, cases, and fresh evidence for comparative analysis. Building on a nucleus of classic studies laying out the nature and development of the concept of corruption, the book also incorporates recent work on economic, cultural, and linguistic dimensions of the problem, as well as critical analyses of several approaches to reform. While many authors are political scientists, work by historians, economists, and sociologists are strongly represented. Two-thirds of the nearly fifty articles are based either on studies especially written or translated for this volume, or on selected journal literature published in the 1990s. The tendency to treat corruption as merely a synonym for bribery is illuminated by analyses of the diverse terminology and linguistic techniques that help distinguish corruption problems in the major languages. Recent attempts to measure corruption, and to analyze its causes and effects quantitatively are also critically examined. 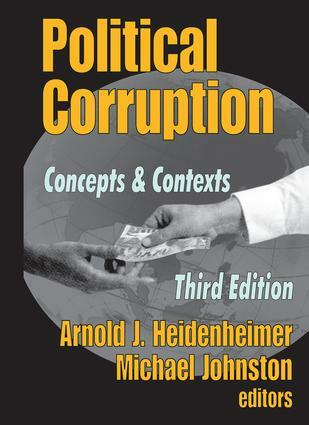 New contributions emphasize especially: corruption phenomena in Asia and Africa; contrasts among region and regime types; comparing U.S. state corruption incidence; European Party finance and corruption; assessments of international corruption rating project; analyses of international corruption control treaties; unintended consequences of anti-corruption efforts. Cumulatively, the book combines description richness, analytical thrust, conceptual awareness, and contextual articulation. What is the Problem about Corruption? High Level Political Corruption in Latin America: A "Transitional" Phenomenon?